This Cottage has the best reviews! We have 5 stars in EVERY category! There are 2 beds, a Queen in the bedroom and a sofa bed in the living room. The sofa bed is a very comfortable queen-sized gel memory foam sofa sleeper. Brand New Cottage! Walking distance to the World Famous StreetCar! And access to over 30 restaurants, bars, shops, and cafes. Whether you're here for business or pleasure, we have you covered. We have high-speed internet, an office desk in a quiet working environment, free national newspapers (Weekend editions including USA Today, New York Times, or Wall Street Journal), snacks to get you started, and proximity to over a dozen restaurants and cafes. Fully furnished! Modern kitchen with refrigerator, oven, stove, microwave, utensils, iron & board, blow-dryer, coffee pot, pots/pans, etc. Grocery only one block away. Rental has a full-size bed and a sofa-bed (this is no ordinary sofa-bed. It is a Queen Sleeper with Gel Memory Foam. It is super comfortable!) Modern tiled bathroom with walk-in shower! Safety, convenience, and fun are our priorities. 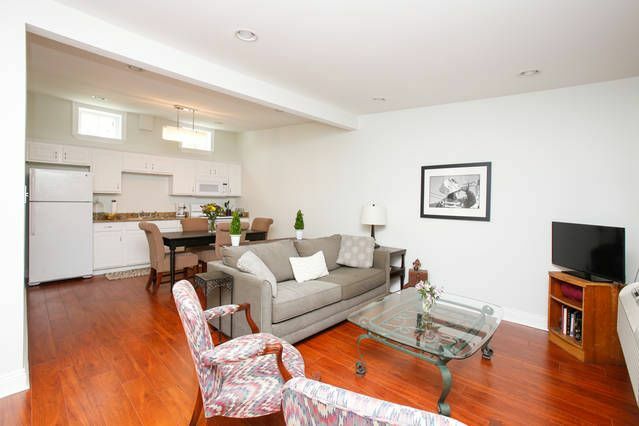 Rental located in a well-lit, secure & private walkway. Come and go as you please with peace of mind. My wife and I live and work in New Orleans and take pride in our house and our city. Our primary goal is to ensure you are comfortable and have a great time in our city. My wife and I created a list of places to visit and recommended restaurants. This list will be on the coffee table. This house is a home. It is comfy, cozy, and of course fully furnished including all of the amenities of a modern home. Stocked with wine, beer & water for free! Full kitchen and fully stocked with pots, pans, utensils, and much more. Full table with chairs The sofa bed is a very comfortable queen-sized gel memory foam sofa sleeper. Nestled in between 3 organic raised bed gardens, in which you have access to basil, hot peppers, rosemary, mint, onion, and more! No steps. Easy wheelchair access. Contact us for dimensions. The cottage was very tidy and comfortable with all of the amenities (kitchen, living area, outdoor patio,etc) that we were looking for. Perfect for a couple. Good location outside of the congested Quarter, but easy to get anywhere on public trans/Lyft. Walked to Mardi Gras parades, Audabon park, and the restaurants on Freret st. The hosts were most friendly and accommodating. Hope we can make it back again. The Uptown Cottage was the perfect place for us to stay while in New Orleans for the Christmas holiday. We didn't have time to enjoy the amenities in the neighborhood, but all that you would need during your stay is within walking distance. The owners provided complimentary wine, beer, water and coffee for us. The cottage was in perfect condition and the cabinets filled with china, glasses, silverware, serving pieces and cook ware if you decided to stay home for a meal. We met the owners and they are delightful. We highly recommend staying at the Uptown Cottage. Private rental in excellent location! We loved this place! Quiet, spacious and clean rental in a great location. Half a block from Freret St. which had several restaurants, bars, and shops right there and walking distance to St. Charles to hop on the street car and get to the Garden District, French Quarter, Audubon Park/Zoo area, universities, etc. Hosts were very accommodating and called to let us know the rental was ready early and then checked to see if everything was ok even though they were out of town. Complimentary drinks and snacks were so appreciated and everything was as promised! Free, very close street parking was easy to find. Would definitely return to this property. Glad you enjoyed your stay! Thanks for the great review. We really take pride in ensuring our guests are comfortable and have a great time. Thank you for your friendly hospitality and great apartment. It was the perfect place to rest and relax in between the adventure of moving my daughter into her dorm at Tulane. Steps from the restaurants on Freret St and close to Tulane & Loyola Universities. This quiet, clean cottage has everything you can possibly need. Garrett and Megan were great hosts, even warning me to move my car when I parked in the wrong place. Would definitely stay again. Located in the heart of the Freret neighborhood, conveniently located Uptown New Orleans. Freret Street is nicknamed 'Restaurant Row'. This charming Uptown cottage is only a 5 minute walk to the World Famous Street Car-Line, the longest running streetcar line in the world. Only minutes from the award winning Audubon Park and Zoo, Tulane and Loyola Universities, and historic St. Charles Ave-New Orleans most famous avenue. Convenience to the Streetcar line offers quick rides to the French Quarter, the Garden District, Central Business District, and Mid-City. Shop, Wine, Dine, & Relax. Walking distance to dozens of restaurants, pubs, mixology bars, live-music venues, pizzerias, cafes, wine emporiums, art galleries, boutique shopping, yoga studios, spas, and grocery stores. Come see for yourself! Experiencing the grandeur of St. Charles Avenue is one of the things you simply can't miss when visiting New Orleans. Stretching all the way from Downtown to Uptown, St. Charles Avenue is a great way to see many different sides of the city, all along one gorgeous avenue. You can explore St. Charles on foot, by car, or, for $1.25, you can hop on the historic, green St. Charles Streetcar.